Bizarrely, despite the large backpacker contingency in India, the idea of hostels is still relatively new. In fact, I am hard pressed to think of any dormitory-type options when I was travelling in the south! In saying that though, the places we did stay at were truly exceptional and I think that it is a concept that will grow exponentially in the coming years. 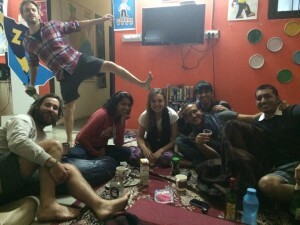 Consider hostel hopping through Rajasthan for a cheap, but also unique, experience. Another blog entry written by Nicky Millar, for more about who she is, and about her awesome travel/volunteering adventure check her blog. Travelling on a budget, me and two other girls opted to stay in the cheapest options available. 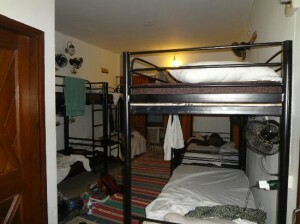 We stayed in mixed/female only large dormitories and throughout felt completely safe. Never once did I worry about my possessions as there were always secure lockers available! The biggest “problem” was the limited hot water. Geysers tended to be small and you had to constantly turn the water on and off to wait for it to heat up again. Other than that I would, without hesitation, stay at these places again were I given the choice! Places can be cheaper in a group as you can get a room for RS 600 and split the cost. For singular travel you pay about RS 450 to RS 550 on average for a bunk. But for me the atmosphere of communal areas and being able to meet like-minded travellers is priceless! Shree, the manager at The Hosteller, one of the friendliest and helpful people I have met to date! While hostel hopping through Rajasthan, we were lucky enough to stay at, in my opinion, the best Rajasthan hostels on offer. Therefore I will try giving a brief summary of each and their specific standout features. Perhaps the smallest of the three, it was a great introduction to the hostel scene! All the facilities were completely up to scratch and the common room, right slap bang as you walked in, was particularly inviting. It did not take much to feel like you were at home and between socialising with other travellers and needing to use their main computer for personal reasons. Further, the staff were always super helpful and accommodating! 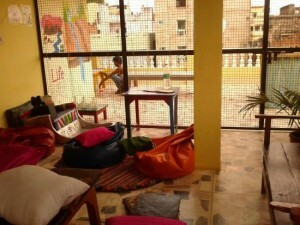 This I would definitely include as one of the best Rajasthan hostels to choose from. Side note: if you are unable/unwilling to go to this hostel I would recommend Yogi’s Guest House. Although we did not stay there, the lady was exceptionally helpful and provided some amazing advice for planning our camel safari. Having only spent a couple of hours there, I can vouch for an amazing rooftop restaurant and a prime location! Opening a mere 3 weeks before our arrival, the staff were truly outstanding! The ensuite rooms comfortable and the breakfasts sublime. Everyone went out of their way to make our stay the most enjoyable it could be! This welcoming establishment made hostel hopping through Rajasthan truly stress-free. From planning 3 separate itineraries for us (we were all parting ways at some point and needed to make individual travel arrangements) to organising an auto to pick us from the bus stand/show us around the city and socialising with us in the evenings—they were a top-notch team! Though not a hostel in Rajasthan, Varanasi is not a site you should consider visiting if passing through North India. This was by far the most organised hostel we stayed at in North India. We were given a daily itinerary of tours (at a small additional cost) and nightly events from boat cruises to Bollywood nights. This is easily the best place to meet people! The common areas are vast, funky and always busy while also maintaining a sense of calm and a lovely homey feel! Breakfast and evening chai tea are included and make for great debrief/planning sessions with fellow travellers. What’s more, there is an “intern program” where foreigners work here for a couple of hours a day and receive free board. This means that there are travellers who have been in Varanasi for a while and have some fabulous tips and tricks to share! In addition this is something that one can consider doing. Impromptu drinks at Zostel in Jodhpur! 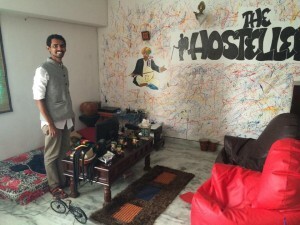 Overall, I genuinely enjoyed all of these places and would not hesitate to recommend them as the best Rajasthan hostels. The only drawback that I can think of is that they tend to be further out of the city than other guest houses. This is generallt common for hostels. So on average you will have to spend about Rs 100 to get an auto into the centre, which is easy enough but bear this in mind. While we travelled independently the help provided by India Someday was invaluable. From booking our Varanasi to Agra train ticket, putting us on a comfortable bus from Mumbai to Udaipur, to recommending this awesome new hostel in Jaipur. If you are pressed for time and wish to have a security net while travelling in India we can highly recommend them. They are unlike the traditional travel agencies you will find.